After looking back upon the first year working with the families of La Unión, one thing is certain: it has been a year of change. 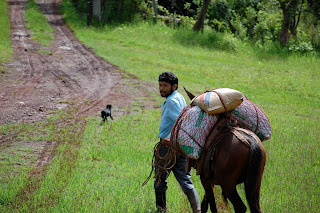 As an organization, UMF has gone through many changes—deciding to focus 100% on agricultural microloans rather than traditional microloans, giving microloans as necessary field inputs rather than money, and learning innumerable lessons from the people of La Unión. More importantly, this has been a year of change for 126 farmers and their families living in the villages surrounding La Unión. We have seen the first steps for growing production, improving quality, managing money and, most importantly, looking to the future so that they can continue to improve their lives. We are proud to say that, with only a few days of loan and training meetings left, 97.3% of the $12,638 given to assist farmer has been returned! (No this isn’t the on time repayment rate, this is the ACTUAL amount). This was used on corn milpas, bean frijolares, and coffee fincas to help ensure a good crop this year. Many of these loans went to farmers that otherwise wouldn’t have been able to grow or harvest. Farmers like Felicita Reyes who, for the first time, was able to plant beans that are helping to feed her family this year. Many more of these loans helped coffee farmers move out from oppressive intermediaries who charge interest rates of 72% and don’t allow farmers to sell their coffee anywhere but through them. Farmers like Evelio Hernandez who is just wrapping up his best coffee harvest ever. As we prepare for the coming harvest cycle, UMF will use this past year of working with and listening to the people of La Unión to make a few changes to the program. We are excited to expand microloans to include fertilizer for new fields, grain silos which will allow farmers to store their harvest, solar dryers to improve the quality of their coffee, and many essential farming tools. We are also excited to give more responsibility to the local boards of directors for incoming members. These town leaders will play an even larger role in selecting responsible members from their communities to enter loan and training groups. Most of all, we are excited to grow! We look forward to adding 150 more farmers into the program and to doubling the microloan amount available to returning members.